"The phoenix has come back alive from its own ashes"
Ever since its first publication over 70 years ago, this classic has served as the foundational text on the art and science of endodontics. Successive generations of students and physicians have not only learnt the basics of endodontics from this book, but have also followed it extensively as an authoritative clinical resource. The book kept pace with the developments in the field till the mid 1980s, when its last edition was published. Grossman's Endodontic Practice has been brought back to life now. This has been made possible by the joint efforts of Dr. B. Suresh Chandra (Editor of Endodontology) and Dr. V. Gopikrishna (Editor of Journal of Conservative Dentistry). It is noticed from the earlier prefaces available in this book, the first edition was released in 1940 in the name of "Root Canal Therapy". The popularity of this edition can be gauged by its numerous translations done in many languages. This edition highlighted the importance of natural teeth and increased the awareness that no dental substitute will function as good as the natural ones. The ninth edition carried the importance of maintenance of asepsis, debridement and total obturation of the root canal. Antibiotics were used both systemically and locally in the form of pastes, to sterilize the canals. The tenth edition mentioned the prevention of pulpal damage during dental treatment to retain pulp vitality. Newer obturation materials and methods were detailed with importance of good seal of apical and coronal end of root canal in the eleventh edition. Gradual shift in endodontic principles from a chemo-mechanically centered approach to a more biologically centered and biocompatible approach. Innovations in materials, instruments, and techniques that have revolutionized endodontic practice in recent years. Over 1100 new illustrations comprising relevant line diagrams, clinical photographs, radiographs, and histological studies. Several case reports illustrating the conceptual and clinical discussions from 24 international contributors and 28 national contributors. Newer diagnostic aspects in endodontics like vitality testing of the pulp by pulse oximetry and laser doppler flowmetry. The chapter on rationale of endodontic treatment recapitulates the theories of Fish, where he presented the zones of infection, contamination, irritation and stimulation . This helps the student to understand the reaction of the peri-radicular tissues to infection. Grossman's formula for determination of the working length (old formula not in use anymore) is simplified and other electronic aids in measuring the length are detailed in Chapter 10. A chapter is allocated for detailed procedures on vital pulp therapy, pulpotomy and apexification (Chapter 13). Chapter 16 on endodontic surgery deals with microsurgery with the aid of dental operating microscope (DOM). This will help the surgical procedure to be more precise and to manage the surrounding tissues with least damage. Magnification and illumination will be the key factors to help and perform these procedures with more accuracy and this chapter is supported with a number of clinical photographs. Theories of endodontic - periodontal related problem and its management are presented in a sequence in Chapter 17. Lasers in endodontics. - Use of laser for treatment reduces discomfort to the patient. This forms a chapter of this book where the shortcomings associated with its use are also mentioned. Hence, a judicious use of laser in endodontics is recommended. Procedural errors and their management: Procedural errors, iatrogenic causes, and wrong decision making in endodontic treatment are mentioned with suitable remedies. Removal of separated instruments in the root canal is well explained with the help of a flow chart. The Appendix at the end of the book explains about radiographic techniques and root canal configuration for easier understanding. Lastly, I enjoyed reading the "Quotes" at the beginning of each chapter, which are very appropriate and serve to motivate the student. Periodic revisions are mandatory when the new editions arrive. This aspect has been taken care of by the editors with an excellent blend of traditional and contemporary treatment procedures. 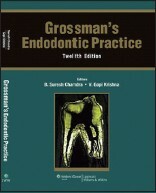 Arrival of the twelfth edition of Grossmans Endodontic Practice will be an asset to both graduates and post graduates. With its comprehensive approach and coverage, this classic is indeed an 'indispensable and priceless text' for both students and practitioners. Dr. B. Suresh Chandra is serving as a professor and HOD of Conservative Dentistry and Endodontics, A. J. Institute of Dental Sciences, Mangalore, India. He is also serving as the Dean of the same institute, Chairman, P.G. Board of studies, Rajiv Gandhi University of Health Sciences, Karnataka, and as the Editor of Endodontology, the official publication of the Endodontic Society of India. He graduated in 1969, from Government Dental College, Bangalore, and was awarded the post graduate degree from the Government Dental College, Chennai, in 1976. Dr. V. Gopi Krishna is serving as an associate professor, Conservative Dentistry and Endodontics, Meenakshi Ammal Dental College, Chennai, India. He is also the Editor-in-Chief for the pubmed indexed Journal of Conservative Dentistry. He is a prolific researcher with nine 'Best Paper Awards', and more than 45 publications, including 14 international journals. He was conferred with the Fellowship award of ISDR. He did his graduation from Annamalai University, post graduation from Meenakshi Ammal Dental College, and received the best post graduate award in 2002, from the Indian Endodontic Society.